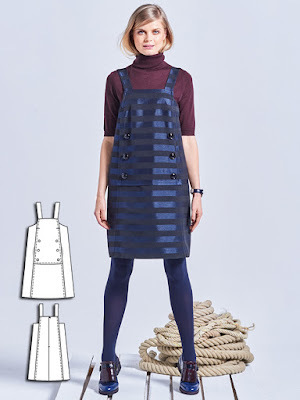 I was all set to make the dungaree dress from the April 2017 issue of Burdastyle, when I saw this one in the October 2016 magazine. I decided this pattern offered something a bit unique, so I changed my plans. This is the 'Jumper Dress' from the October 2016 Burdastyle magazine. It has interesting seaming at the front with pockets at the waist. I used cotton velvet fabric for this that I acquired in a closing down sale recently. The business selling it made set designs for stages and elaborate parties. They had almost sold all their fabric, but I got this velvet in green and some more in black. While I was there, I got chatting to the guy about their business. He showed me some massive pieces of red and blue fabric that had been used to decorate the house of Australia's richest woman for a party a few years ago. I mentioned that my son's primary school was doing a musical and wondered if they could use the fabric. He immediately beetled off and showed me some huge wooden stage backdrops. He said they would be perfect for the school and, before I knew it, I'd somehow agreed to having six of them strapped to my roof rack. I tentatively drove along the highway to the school, warning the music teacher of the impending arrival of the enormous backdrops (not texting and driving, of course). Then, she and I attempted to unload them. This was easier said than done. We were huffing and puffing after moving just one. Fortunately there were some road workers nearby and one was more than happy to ditch his Stop sign and help the young and attractive music teacher heave the rest of them into the school hall. Traffic chaos ensued, but eventually my car was unloaded and I scurried home with my velvet. When I make Burdastyle patterns, I do try to follow the instructions, but almost always end up doing my own thing. This pattern was no different, but was fairly straightforward to make. The back has an invisible zip, which is positioned on my back in a place that is almost impossible to reach. Luckily I can get this on and off without using the zip. The pockets are inserted into the seams of the side panel. I didn't have enough fabric to line them with the velvet, so they show a bit from the side, but that's ok. The dress turned out a bit loose, so I took in the side seams a bit. I also needed to lower the darts. The gold buttons are decorative and just sewn in place without buttonholes. This fabric is really difficult to photograph, but it is really quite nice. The dress is cosy and I love the style. I'm wearing it here with a cashmere jumper from Potter Textiles (RTW from a fabric shop isn't really RTW, you know) and Megan Nielsen Virginia leggings. Oh this jumper dress is really cute. Love the buttons and the way you have styled it. Such a fun outfit!